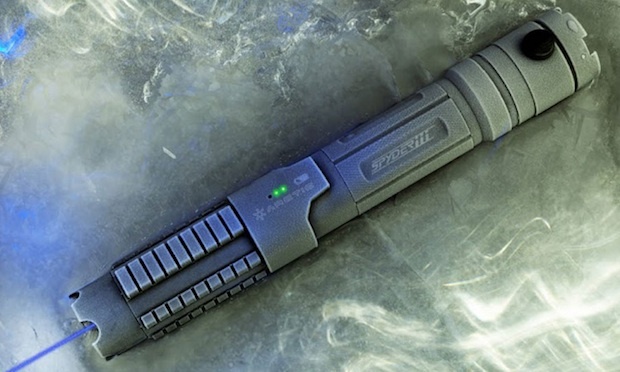 That little hunk of frost-coated hardware in the photo is the Spyder III Pro Arctic blue handheld laser. It’s being marketed as the closest thing to real-life Star Wars lightsaber ever. Because this $200 piece of Chinese gear can fry your retinas. The product’s sales spiel is pretty no-nonsense: “For the first time in history, direct blue laser diodes have now become available in the consumer market. The laser powered home theater projector is the first of a large family of audio and video media technology to feature direct blue diodes. Wicked Lasers took the direct blue laser diode components and made the world’s first 445nm direct blue diode laser, the Arctic.” Fascinating. And for those scientists among you it’ll be doubly interesting, as the race to make cheap portable direct blue lasers has been long and hugely complicated–the physics of them has always seemed to be frustrating. Blue lasers are what make Blu-ray players work, and they’re important because the shorter wavelength of the blue light versus red or infrared lasers means you can focus the laser to a smaller spot: This gives Blu-rays their much higher data density than DVDs or CDs. In the case of the Spyder III, the blue light is more of a fun sales pitch–emphasizing the cool, blue light instead of garden-variety red or even the increasingly common green lasers on the market. The question, of course, is, what exactly will be the Spyder’s targets? If you’re talking about putting a spot on screen during a PowerPoint presentation, you’d probably be able to do that with the Spyder from the next country over. The device is touted as being “4000% brighter than the Sonar’s 405nm violet beam” and while this is a tad misleading, since the wavelength and brightness aren’t tied, what is important is how intense the Spyder actually is. It’s a Class iV laser product, which means it technically needs to be slapped with a yellow warning label that reads “Laser radiation. Avoid eye or skin exposure to direct or scattered radiation.” I used to use a desktop Class IV laser for experiments, and after seeing some laser injuries I was petrified of the thing–they can burn your skin and blind you by scarring your retina really easily, in some cases by indirect reflections off a matte surface. And for those of you who remember the spate of laser dazzling incidents, with people firing them into the cockpits of airliners on final approach to airports (one was in the news as recently as April, with a guy trying to distract the pilot of a police helicopter) your level of worry will now certainly be elevated: Those lasers could merely dangerously dazzle pilots for a brief instance, these could blind. Permanently.